There’s not much that the Generac 5991 isn’t capable of. This power washer has got massive potential thanks to its 3000 PSI output at 2.7 GPM that can be modulated using the Quick-Click nozzle tips it comes along with. You get a 25 degree, 40 degrees, 15 degrees, 0 degrees and soaping tip with a long 30-foot hose. Together with the sturdy welded frame design, gun holster and built-in step for quick starting, there is everything a homesteader will want in a semi-pro model. 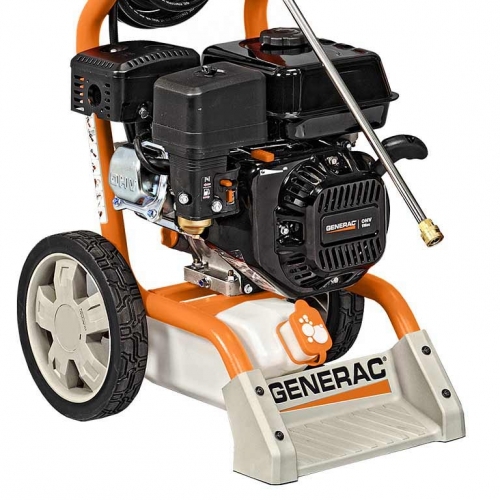 One last thing, this pressure washer uses a powerful 212cc OHV Generac engine. It is protected by a 2-year warranty. Switching spray nozzles or tips, attaching the wand, starting the massive engine, dragging it along bumpy terrain, power washing any kind of surface or stain, everything is mighty easy with this pressure washer. Honestly, this is the easiest pressure washer to handle in the market. Even assembly does not take more than a couple of minutes since it comes mostly pre-assembled. All you need to do is attach the handles to the main unit. The only real complaint I have against the Generac 5991 is the noise levels. The 2500 and 2700 PSI models are quite noisy but this is just phenomenal. It creates a really loud noise and standing too close to the washer in a confined space can literally deafen you for a few seconds. Having said that, I have given it 3 stars because of the subsequent power output. Generac OneWash "The Power to Clean"
3000 PSI at 2.7 GPM, what more can you ask for. This is probably the best semi-pro power washer in the market. I am even inclined to include this pressure washer in the professional range because of its construction and power. There is literally nothing that you cannot do with this washer. Want to decrease the power, use the white tip or the 40 degrees and soap nozzle. You will never have any issue trying to clean something. For less power, the nozzle heads do the trick and for unadulterated power and pressure rely on the finer tips. There are sufficient pressure and regulation for any kind of task. The Generac 5991 does not suffer from power issues at all. 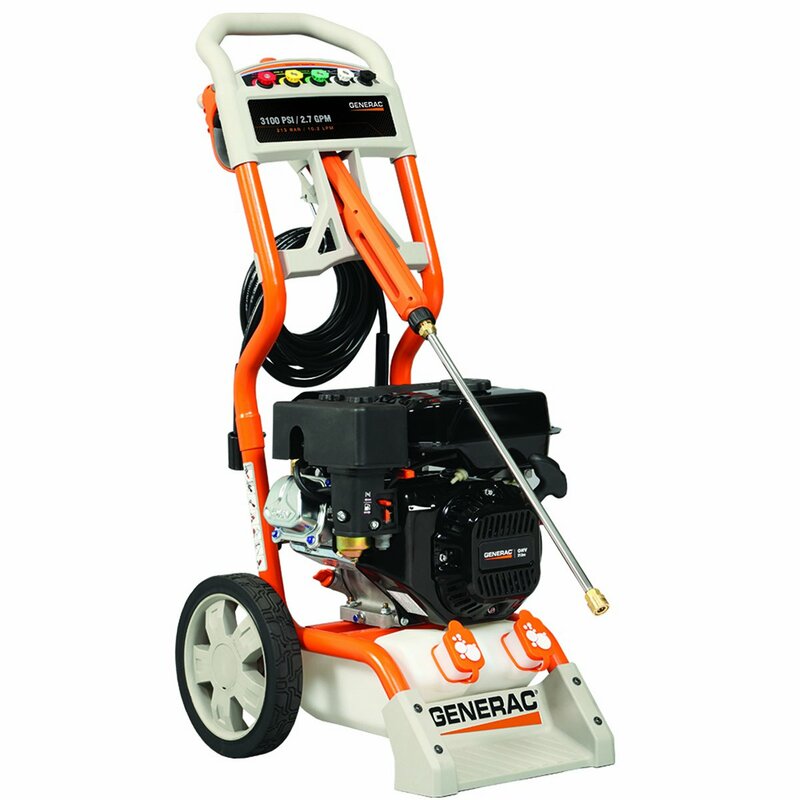 Unlike other Generac pressure washers that have a few complaints against reliability due to a manufacturing defect, the 5991 is much more dependable. It is constructed from welded frame design, uses superior parts and lasts really long. Read any review anywhere on this particular model from Generac and you will instantly notice the great reception it gets. Okay, so Generac isn’t the best in terms of customer support. However, with the 5991 you will never have to approach their customer support. The washer lasts really long with zero need for replacement parts. Even the hose and nozzle tips are all durable and well constructed. I am no fan of Generac customer support but rate this a 5/5 for this particular model because you never really have to call in for help within the 2 year warranty period. OHV 212cc Generac engine at the same level with the pump for easy hose connections. Perfectly balanced upright design makes it easy to move around. 3000 PSI and 2.7 GPM output. Quick access to oil indicator, shut-off and choke and fuel shut-off switches. Packed with plenty of power, durable and long lasting design with portable upright positioning. The massive engine is not properly muffled and so it makes a lot of noise. Also expect the washer to be slightly overpowered for some tasks. In short, the Generac 5991 is a powerhouse with loads of pressure, plenty of volume and immense dependability. There is literally nothing that it cannot achieve and considering the price it retails at, it is way cheaper than your average professional grade pressure washer. What you see is what you get with this pressure washer. In my opinion this is the best gas pressure washer in the market in terms of longevity and cost to performance ratio.